Americans have been wonderfully impelled for varied reasons to render small buildings and structures. From the mid-19th until the mid-20th century, mostly anonymous persons have with purpose and skill created the buildings of their real or imagined communities: houses and churches, stores and factories, carousels and Ferris wheels, bridges and follies, castles and capitols and grand civic places, Grant’s Tomb and Independence Hall, gas stations and temples and barns, and seventeen documented early buildings of Queens New York. Not dollhouses, birdhouses, or architectural models, they yield a verifiable category of national artful endeavor – and a remarkably unexplored area of American material culture. The structures reveal architectural history as well as craft, problem solving, values, and imagination. They uniquely conjoin three significant components of national life: history, architecture, and folk art. 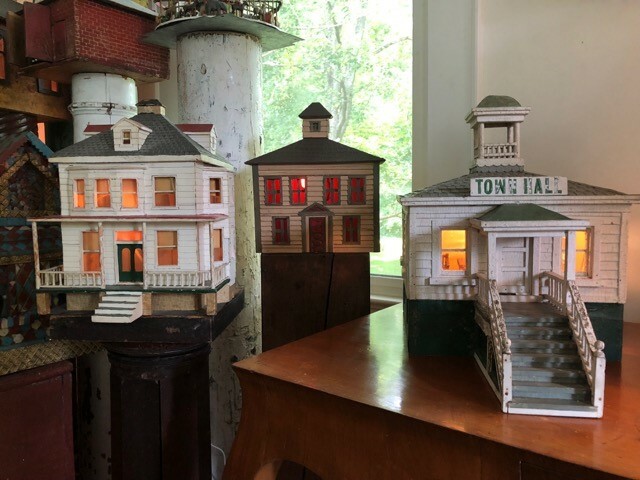 The collection of Steven Burke and Randy Campbell is the nation’s largest and only such gathering, contained in the three Greek Revival buildings they designed themselves to house daily life and expanding townscape. Mr. Burke has been gathering the small community since 1985, joined by his happily patient husband Randy Campbell. Mr. Burke’s profound interest in architecture and folk art has found its place over the years amongst a degree in Religion & Literature from Duke, instructional design & education, and 28 years in state, national, and international life science development. Rendered Small, a 16-minute documentary by Marsha Gordon and Louis Cherry about the collection and the collectors will be shown within the Glimmerglass Film Days, on November 10 from 10:00-11:30 AM. The talk is included with admission to either Fenimore Art Museum or to Glimmerglass Film Days.